These simple and sweet yoga pants can be worn with any of the yoga tops. 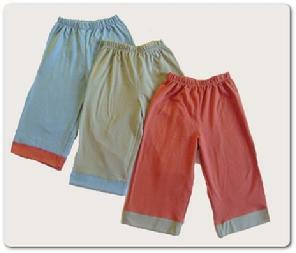 They are unisex and are two-three year pants, because of their very generous fit. They can be worn the next year as a cropped pant. Soft and durable. This practical and functional comfortable pant is perfect for all activities. The contrasting trim adds to the stylish and fun design. Ohgeez Organic Clothing Company uses soft, durable, stretchy, and comfortable 100% certified organic cotton jersey in all their clothing. The practical designs and colors work for both boys and girls. Ohgeez is committed to the preservation of the earth and the health of children, always using organic fibers, low impact dyes, and domestic manufacturing. 2T 34" - 36" 28 - 32 lbs. 3T 36" - 38" 30 - 40 lbs. 4T 38" - 40" 34 - 45 lbs.